MARIN CITY, California (WABC) -- A man is sharing his heartwarming, yet heartbreaking story of helping a homeless man get back on his feet in an effort to help spread love. 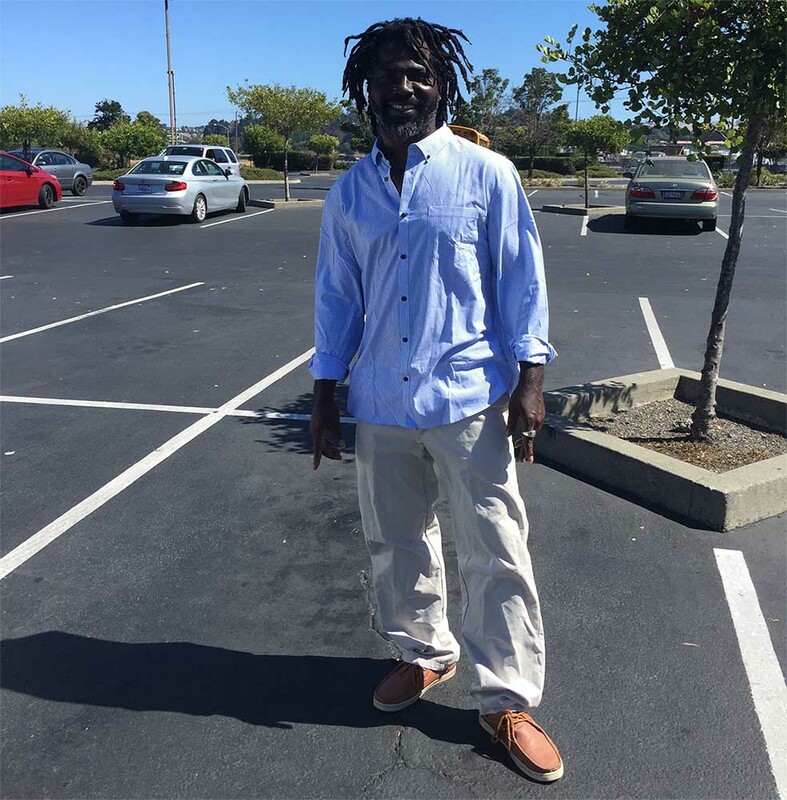 Adam August, 28, said he had seen a homeless man at a Starbucks near San Francisco several times last year. "Every time I'd see him I'd tell myself that I would take him to lunch but always found an excuse not to," August wrote. But one day, August, who works in the tech sales field, worked up enough courage and asked him to lunch. During their meal, August learned the man - 37-year-old Tarec Atkinson - was born and raised in Jamaica. "When he was a kid, he dreamt of being a famous futbol (soccer) player. He was recruited to play in school but never got the opportunity because of some trouble he got in as a teenager," August wrote. "He moved to the states 8 years ago and has spent the last 12 months living in a tent by the side of the freeway. Tarec goes days without eating, sometimes living off of the berries he picks, he spends 90% of his time alone and has no friends and no family in the states." Atkinson told August it had been a month since he bathed, so August took him to his apartment so he could shower. But August knew the hot meal and shower weren't going to get Atkinson back on his feet. "Because of all these hardships, trying to get a job is impossible," August wrote. "How can you fill out an application when you haven't eaten in days? 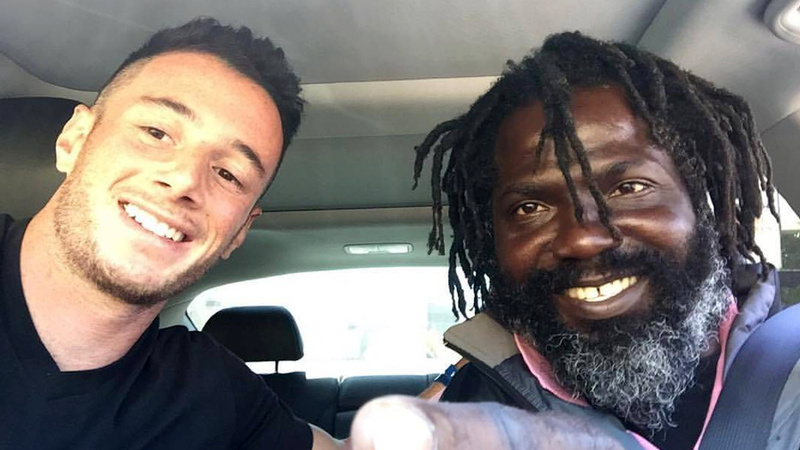 I told Tarec that I would drive around with him next week and help him fill out applications and even speak on his behalf to help him land a job so he can get back on his feet." They met later that week. August stopped at the store to get Atkinson some new clothes. "I was blown away at the immediate change in his demeanor," August wrote. "His smile was radiant, he stood up straighter, and even walked with a swagger." The duo spent the next two days traveling around town seeing which retailers were hiring. They hit up more than a half dozen stores. "I would walk in with him so he knew he wasn't alone. It can be overwhelming to walk into a business and ask for a job," August wrote. "I was very proud of him. We had a few positive responses but the majority of business's told us that applications were submitted online. Of course, Atkinson doesn't have a computer. So August took Atkinson to the library, where he guided his new friend through the process - and learned something valuable, too. "We've all heard someone say 'why don't they just get a job?' or 'they're lazy.' I saw firsthand how the "system" is set up to fail people like Tarec," August wrote. "There is no way he would have been able to do any of this without my help. Just like there are many things in my life I have needed someone to help me overcome an obstacle. We all need a little help." Their work paid off. Atkinson landed an interview at a local grocery store. 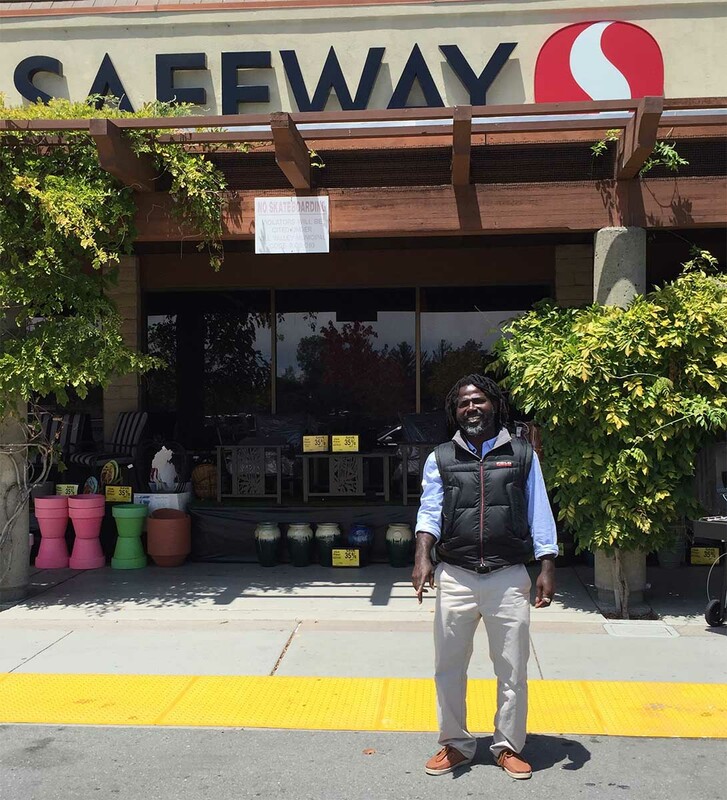 "I remember driving to Safeway being nervous," August wrote. "I looked over to him and asked how he was feeling. He looked back at me and said 'I got this.' I believed him." Twenty minutes later, Atkinson shared his good news - all without saying a word. "I dropped him off, wished him luck and waited. 20 minutes later, I see him walk out of Safeway with a big smile and a thumbs up," August wrote. "I let out a Rick Flair sounding 'WOO!' We had accomplished a lot together in two weeks. It was an incredible moment." After Atkinson landed the job, August decided to write about his story of helping another human. "My hope in sharing this story is that it will inspire others to spread LOVE. We all need help in one way or another. Sometimes all someone needs is a friend," August wrote. August said he lost touch with Atkinson over the next few months. During this time, Atkinson lost his job. "Holding a job when you sleep in a tent and can't shower every day isn't a recipe for success. I didn't appreciate that fact a few months ago. I do now," August said. He's jumping back in to help again - now trying to make it permanent. "The outpouring of support from thousands of people has inspired me to finish what Tarec and I started," August said. "I'm going to launch a gofundme page for him and try and find him a home." The fundraiser site has since been created with a $25,000 goal set and details on how the money will be used to assist Atkinson. August said he's also working to connect with a local homeless organization that may be able to help. Read August's full story here.